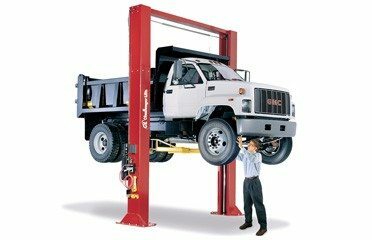 Challenger Lifts 15000-3S Symmetric cargo vehicle 2-post lift w/ 3-stage front and 3-stage rear arms (14′ 6″ ht.) – Designed specifically for Sprinter style cargo carrying vehicles. Oversized steel pulley reduces stress on equalization system and provides increased durability. Padded overhead shut off system prevents vehicle damage from being raised too high. 60″ lifting carriage lessens column stress by dispersing load. NEW 3-stage front and 3-stage rear arms gives extended reach and retraction making it easier to lift a wider variety of cargo carrying vans. • Lower profile Standard pad adapter is 16% lower than the standard 15,000 lb capacity 2-post lift to accommodate lower profile cargo vans. • Ease of operation Single point air actuated lock release allows technician to disengage locks in both columns simultaneously. • Stronger and more durable designed Oversized steel pulley reduces stress on equalization system and provides increased durability. • Greater load spread 60” lifting carriage helps to provide a more equal spread of weight which can prevent premature column wear. • Safety engineered Padded overhead shut off system prevents vehicle damage should a vehicle come in contact with he overhead shutoff bar.